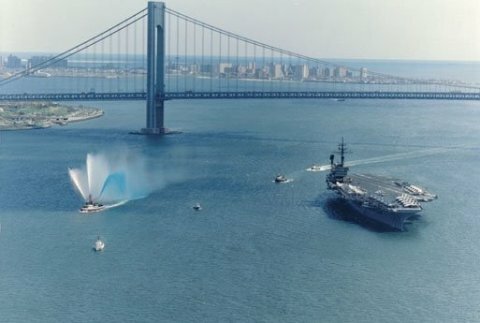 Yesterday was the first day of Fleet Week New York - the city's celebration of the nation's sea services. The official dates of the 24th edition of the event are Wednesday May 25 (yesterday as we write this), through Wednesday, June 1, 2011. With 3,000 Sailors, Marines and Coast Guardsmen in town, you'll certainly get the chance to meet (and thank) one or two, and we encourage you to attend. You can also get an up-close and personal look at many of the ships on display. If you are in the tri-state area, this is a great way to spend at least part of your Memorial Day weekend. National Safe Boating Week 2011 continues through Friday the 27th. Please take this time at the beginning of the busy boating season to think about (and practice) boating safety. A good place to start while you're online is at FirstBoat's boating safety resources page. Details about these and upcoming events, including links to the official event websites, are on our calendar of boat shows. If you would like an event added to our calendar, please send us an email - boatshows@firstboat.com.